In a recent ChessBase article about copying we commented on a game (Marshall v Capablanca, fifth match-game, New York, 1909) in which many writers have claimed that White overlooked an immediate win with 45 Qe8+ Kg5 46 f4+ Kg4 (or 46...Kf6 47 Qh8+) 47 Qe2 mate. 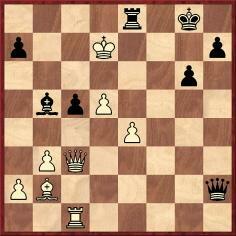 As is well known, no such win was missed because in the game Marshall’s queen stood not on c6 but on b6. 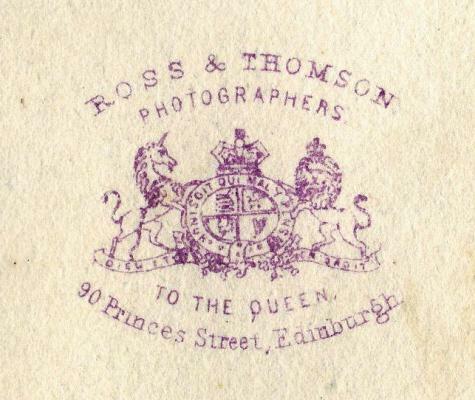 Was this the publication to which Chernev was referring, even though he wrote ‘page 10’? 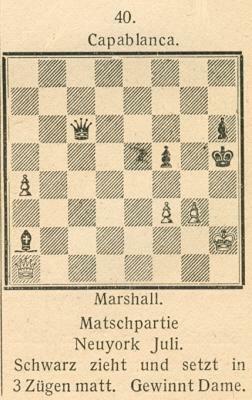 Our correspondent observes that the game was given as won by Marshall against Jacob Rosenthal in the 1913 team match between the Manhattan Chess Club and the Franklin Chess Club, being accompanied by various details about the occasion in Soltis’ narrative of Marshall’s chess activity that year. 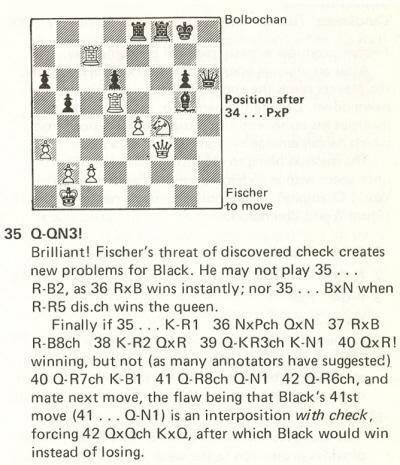 However, on page 369 of Walter Penn Shipley by John S. Hilbert (Jefferson, 2003) a different game was presented as played in that team match – a French Defence in which Marshall was White against Shipley. 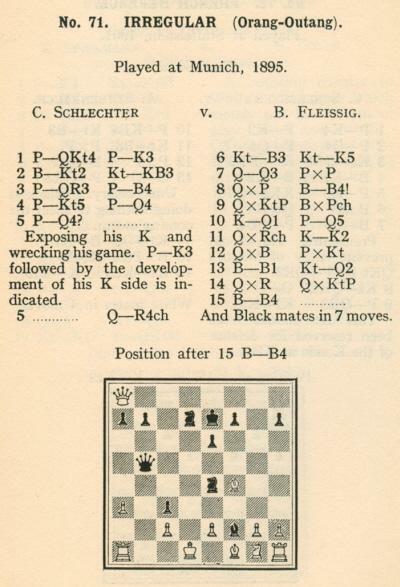 Commenting that the latter game was published in the report on the match on page 150 of the July 1913 issue of the American Chess Bulletin, Mr Hébert asks why two games against different opponents have been ascribed to Marshall. 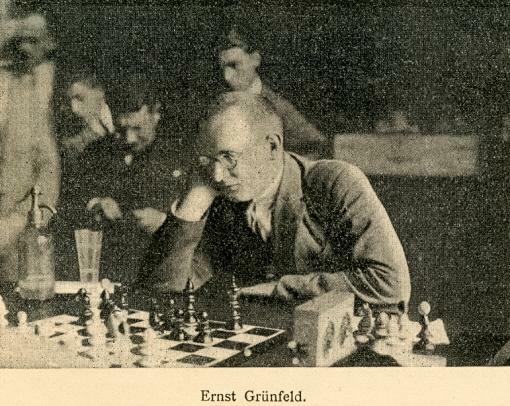 As John Hilbert (Amherst, NY, USA) points out to us, the above Rosenthal v Marshall game was played in the match between the Manhattan Chess Club and the Franklin Chess Club three years later, on 30 May 1916. 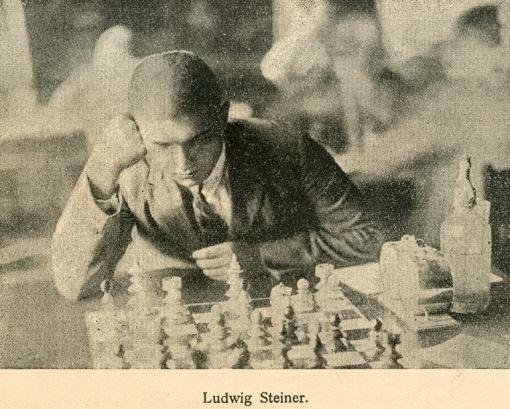 The game-score was given, together with the full match result, on pages 156-157 of the July-August 1916 American Chess Bulletin. Marshall v Shipley (1913) was played in Philadelphia, and Rosenthal v Marshall (1916) in New York. 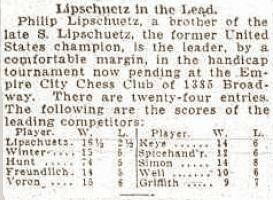 Page 157 of the July-August 1915 American Chess Bulletin reported that the event, the second handicap tournament of the Empire City Chess Club, had recently been won by ‘Philip Lipschuetz, brother of the former United States champion’. 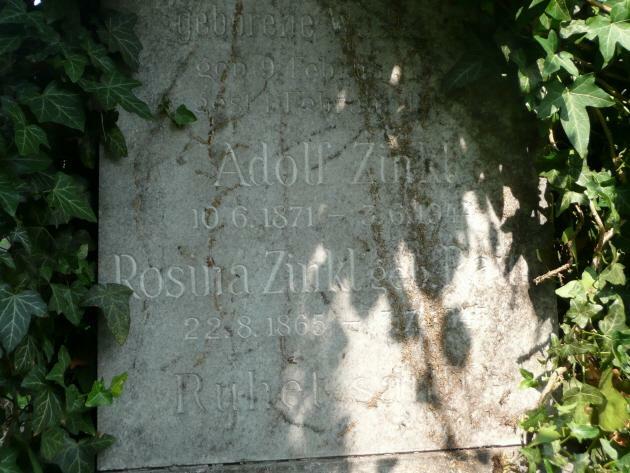 At present, the forename of S. Lipschütz is still uncertain. See the items listed in the entry for him in the Factfinder. Leonard Barden (London) notes that Mason can be seen in a Pathé newsreel. Robert Sherwood (E. Dummerston, VT, USA) points out that Chigorin signed his name ‘M. 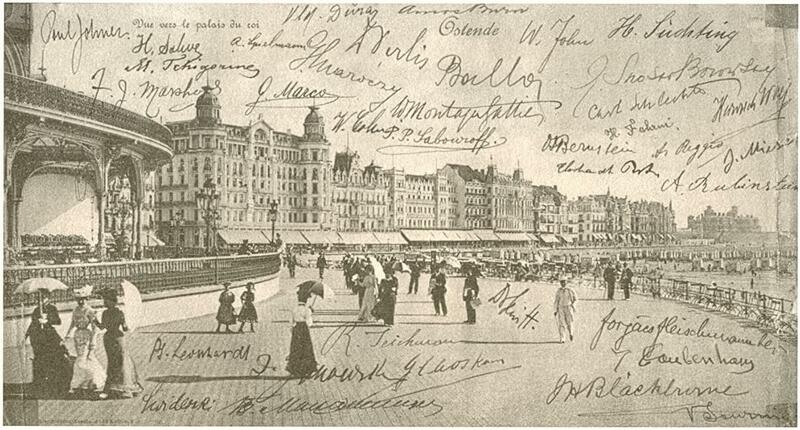 Tchigorine’ on a picture card reproduced on page 81 of The Second International Chess Tournament Ostende 1906 edited by A.J. Gillam (Yorklyn, 2005). 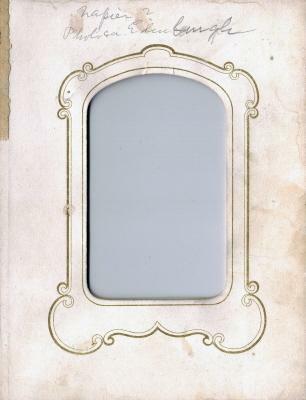 The card, owned by the book’s publisher, Dale Brandreth, is a remarkable piece of memorabilia, signed by all the participants in the master tournament. Dale Brandreth, one of the chess world’s best booksellers, now has a website. 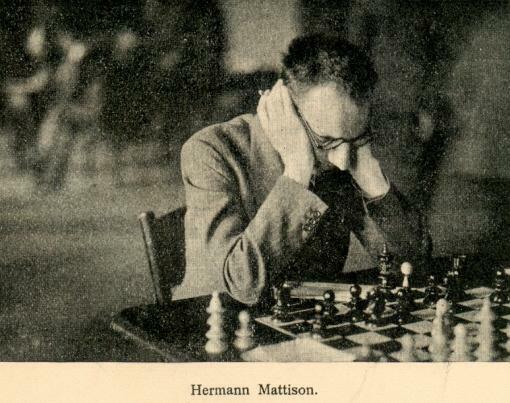 ‘The problemist’s definition of a pure mate is mate where every square around the mated king is blocked or guarded only once, and the king’s square is attacked only once. A double check is allowed if each check would individually be refuted (hence “essential double check”). Where a pin is involved it is deemed not to matter whether or not the pinned piece is blocking a flight square. The Krebs v Ginsburg finish in C.N. 6648 is not a pure mate because a7 is both blocked and guarded, but there must be any number of games ending in pure mates. Some standard mates (e.g. Philidor’s legacy, Boden’s mate and the epaulette mate) are naturally pure. 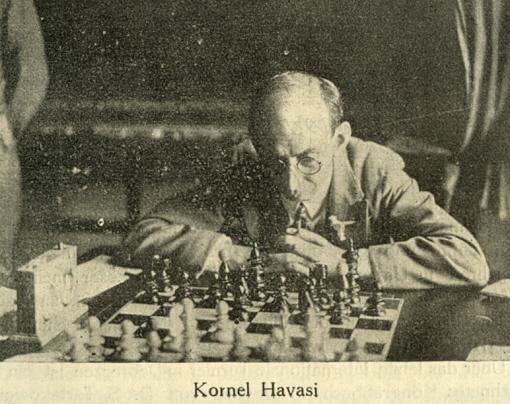 I have looked through Chernev’s 1000 Best Short Games of Chess (only the games with diagrams) and note that all the following have pure mates: 42 (essential double check), 44 (Bd8), 96, 97 (again, essential double check), 110, 147, 153, 168, 212, 218, 225, 266 (perhaps the most beautiful example), 291, 310, 323, 402, 439, 466, 597, 605 (Steinkühler v Blackburne), 610, 694 (including a pin), 751, 758, 767, 778, 792, 943, 952 and 967. More interesting are the games which end in a model mate, a pure and economical mate (economical being defined as employing all of the mating force with the possible exception of king and pawns). 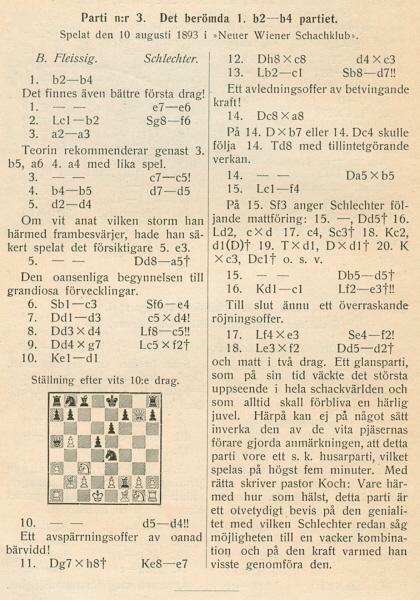 Anderssen’s celebrated games against Kieseritzky and Dufresne (945 and 991 in Chernev’s book) both end in models, as do games 815, 824, 827, 855 and 868. Game 341 ends in a pin-model. As regards pieces with heads of the opposite colour, we are grateful for a number of contributions. With regard to Poland, Tomasz Lissowski (Warsaw) recalls the photograph of Dolo Falk which he provided in C.N. 4623. 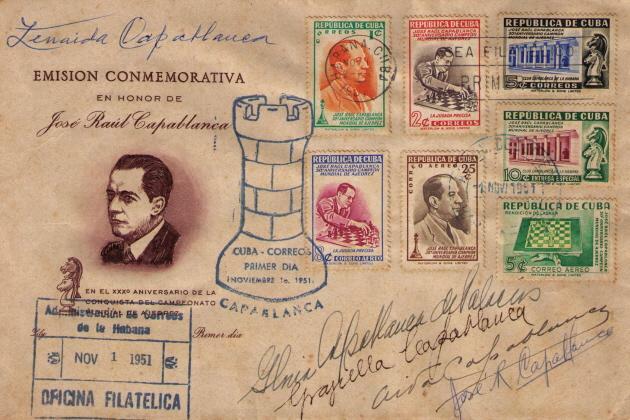 See also the photographs of Capablanca in Warsaw in 1935 which he contributed in C.N. 6489. Furthermore, our correspondent recollects occasionally seeing pieces with different coloured heads even in the 1970s, whereas the Staunton pattern now has to be used in official events. In Austria, Charles Milton Ling (Vienna) informs us, bishops with mitres of the opposite colour were still in regular use in tournament competition until the 1980s, after which the Staunton design became universal. ‘I believe that bishops (as well as kings and queens) have had heads of the opposite colour since the 1880s. They were designed around 1885-86 by Bohuslav Schnirch, who was the first President of the first chess club of importance in Czech countries: the Český spolek šachovní, founded in 1884. There are many variations of the Schnirch pieces, and C.N. 6611 gave two examples. 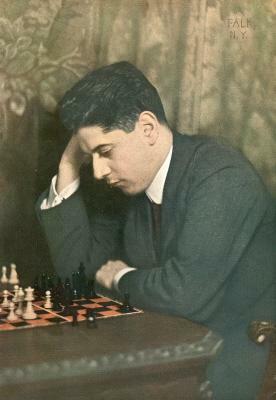 The pieces in the Pachman picture are closer to the original pieces than those being used by Hromádka. 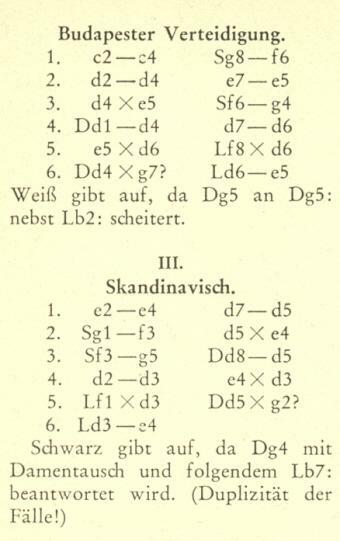 All these variations were also called “České klubovky”. Identification assistance will be appreciated. With regard to the surprising statement that Schlechter was White, Mr Kalendovský reports that no correction appeared in any of the three subsequent columns. He asks what the truth is about this famous miniature. Information about the game’s early appearance in magazines, and especially in 1893, will be appreciated. The score was given on pages 52-53 of the February 1894 Deutsche Schachzeitung, although with no mention of Schlechter. 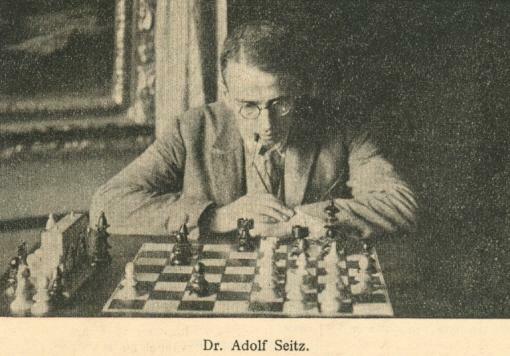 There was particularly cautious phraseology about the game having allegedly been lost recently by Fleissig (‘Angeblich soll diese Partie von dem Wiener Schachspieler Fleissig kürzlich verloren worden sein’). In 1895 the game was published more widely. For example, it appeared (without a date or occasion, but with notes by Mason) on page 353 of the August 1895 BCM, the score having been taken from the Times-Democrat. 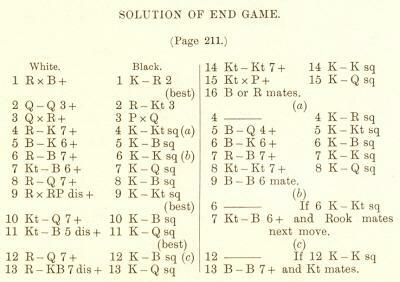 It was also given (headed Vienna, 1893) on page 122 of the December 1895 Chess Monthly. The game is on pages 497-498 of Goldman’s posthumous book Carl Schlechter! 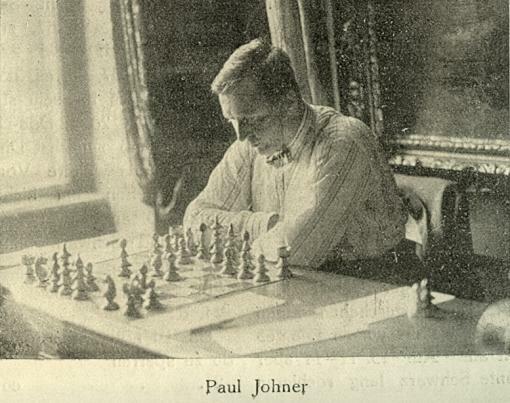 Life and Times of the Austrian Chess Wizard (Yorklyn, 1994), with Schlechter specified as the winner and the occasion given as Vienna, 10 August 1893. It seems to us that those details are most likely to be correct, but, as ever, any further evidence – for or against – will be very welcome. 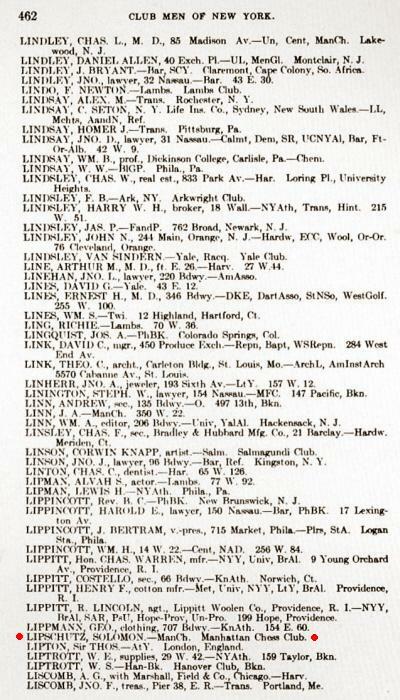 The unpublished list of newspaper columns compiled by H.J.R. Murray specified (item 1560) that the columnist was Sam Loyd. 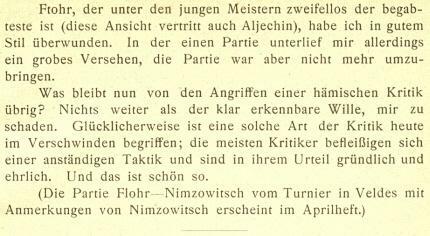 ‘I would draw attention to the correspondence item which begins “Wien (B.F.)” on page 127 of the April 1894 Deutsche Schachzeitung. Fleissig admitted having lost the game in question to Schlechter, although he considered it a skittles game (“Husarenpartie”). So there is no doubt about the authenticity of the game or about who won. The footnote on page 497 of Goldman’s book on Schlechter is obviously based on that Deutsche Schachzeitung item, although no source is given. 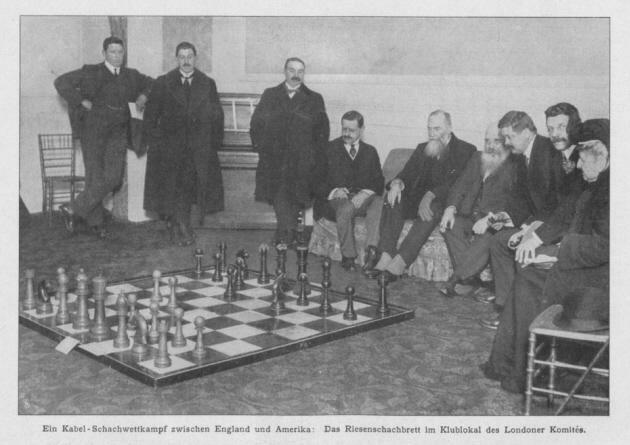 Deutsches Wochenschach published the game as played “some weeks ago in Vienna” on page 206 of its 30 June 1895 issue, quoted from the Times-Democrat. A number of readers have suggested that the quote in Alan Bennett’s diary may have been a reference to the 1957 Ingmar Bergman film The Seventh Seal, although the particular point of the remark has yet to be explained. That, in fact, was where we stood before C.N. 6663 was posted, and further ideas will be appreciated. 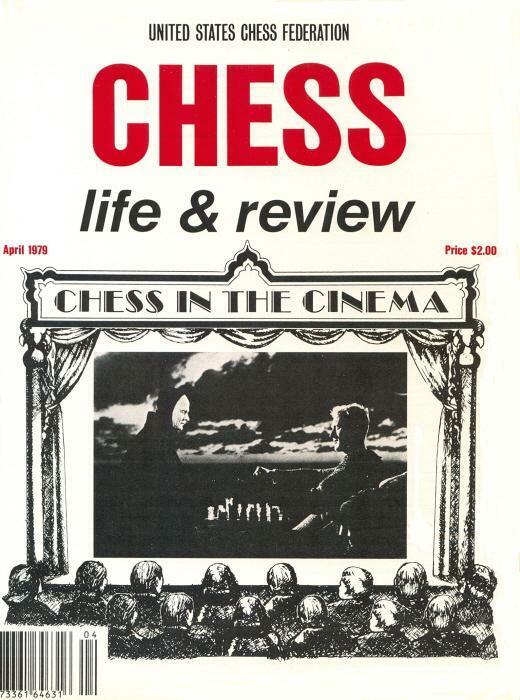 The Seventh Seal was featured on the front cover of Chess Life & Review, April 1979 and discussed by Frank Brady on pages 456-457 of the August 1979 issue. 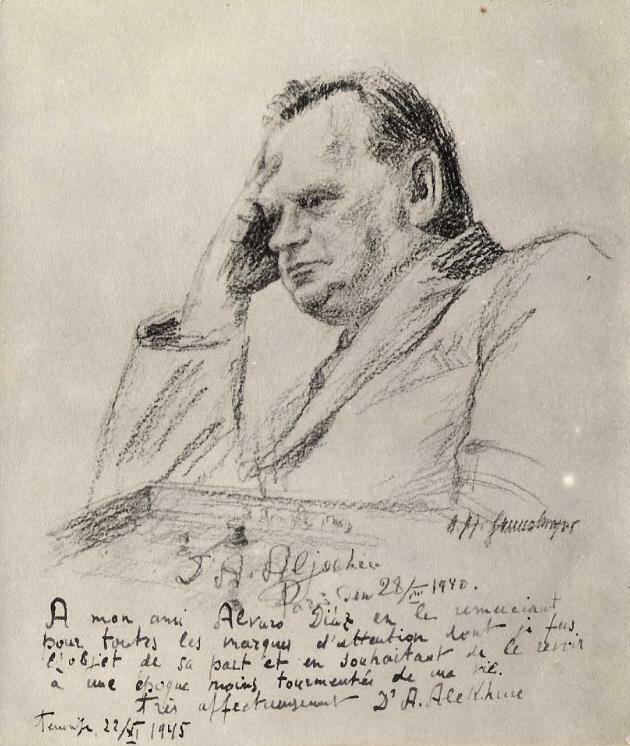 The second item (with Alekhine’s inscription, written a few months before he died, on a photograph of a sketch made five years previously) is of particular interest. 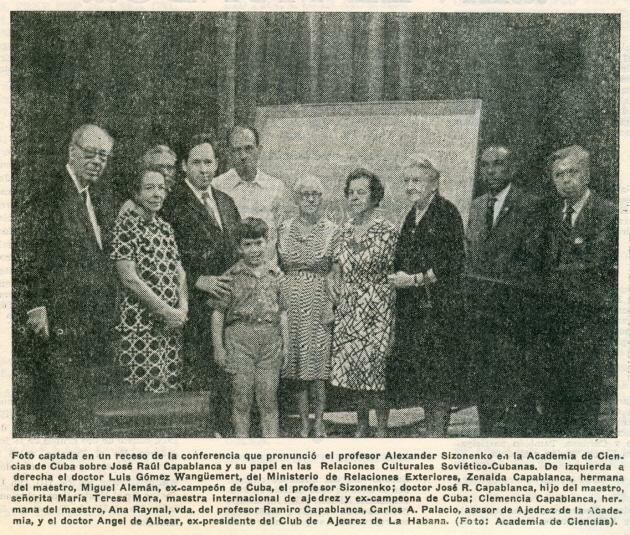 The warm dedication is to Alvaro Díaz, whom Alekhine thanks for his many kindnesses, adding that he hopes to see Díaz again at a less turbulent time in his life. 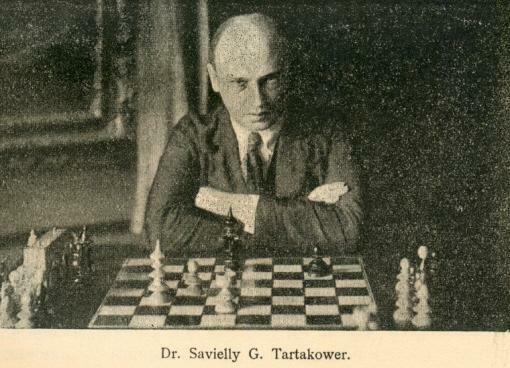 These photographs, together with others taken at Debrecen, 1925, were also published in Das entfesselte Schach by S. Tartakower (Kecskemét, 1926). 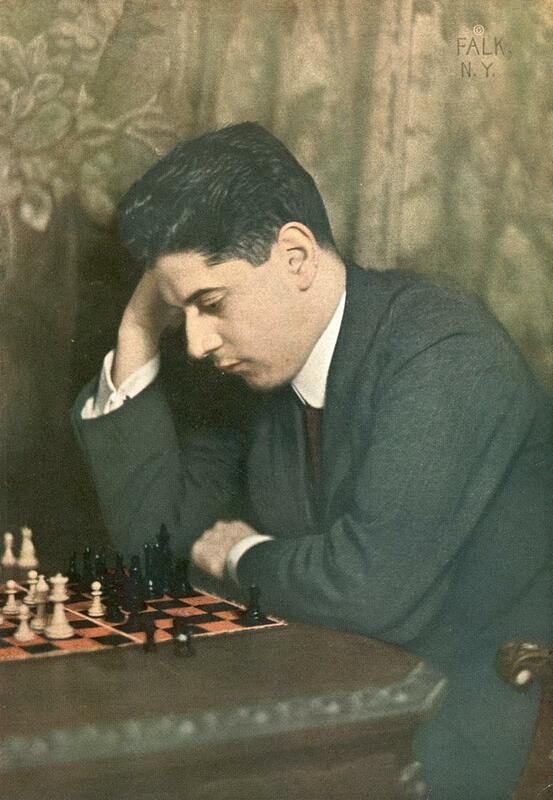 Hoban knows everything except the identity of the ‘unknown guardian, a benefactor whose name never was revealed, but whose memories of happier days and beautiful chess games had been reawakened when he saw the name of a chess immortal – Akiba Rubinstein – on his death list’. Martin Hopkinson (London) asks for information about the chess bookplate for the Alain White Collection, now housed in the South African National Library. 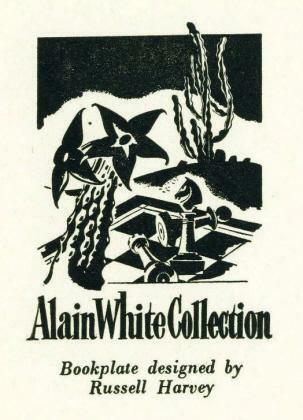 White was also a botanist, and the bookplate combined his two interests. The book’s next two pages had an article ‘The Alain White Collection in the South African Library, Cape Town’ by D.H. Varley, the Chief Librarian. A three-mover by McIntyre, highly praised by A.C. White, was given in C.N. 2882. 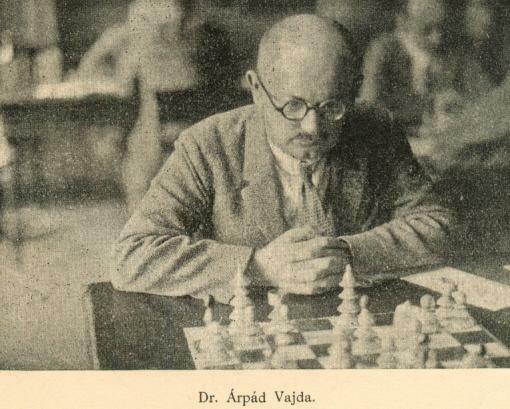 See page 319 of Chess Facts and Fables. 1 e4 d5 2 Nf3 dxe4 3 Ng5 Qd5 4 d3 exd3 5 Bxd3 Qxg2 6 Be4 Resigns. 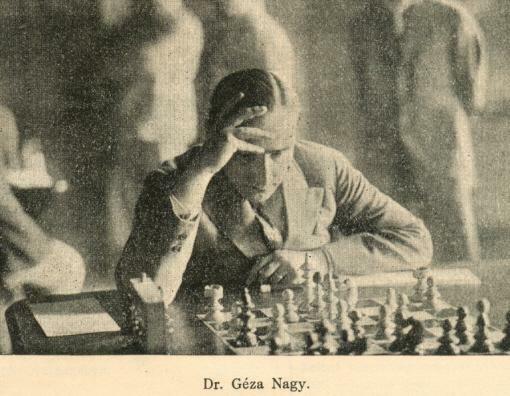 See, for instance, page 103 of Assiac’s Adventure in Chess (London, 1951), although it stated that ‘Krejzick’ defeated ‘master Takasch’ in 1921. The same spellings and date appeared on page 102 of Pour mieux jouer aux échecs by Maurice Beaucaire (Paris, 1967). 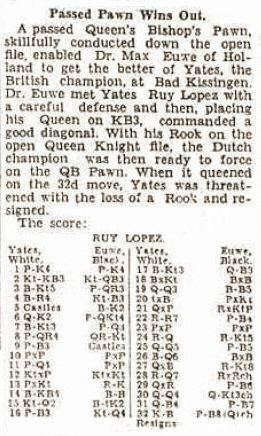 In reality, Euwe was White, and Yates’ victory was highly praised on pages 159-161 of the tournament book by Tartakower. 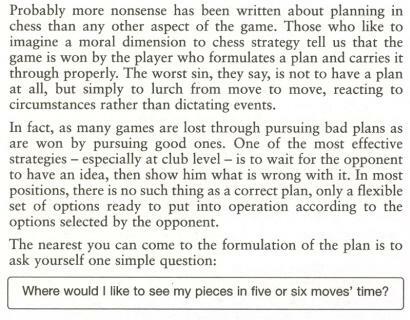 Yates’ own notes appeared on pages 101-102 of his posthumous book One-Hundred-and-One of My Best Games of Chess (London, 1934). 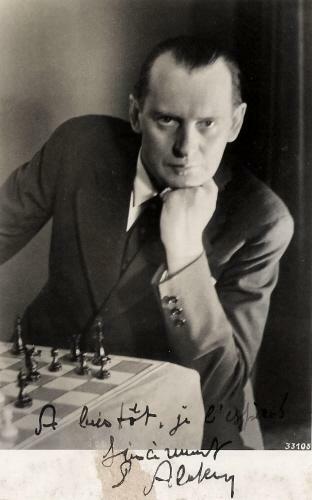 One of Euwe’s most famous wins is the ‘Pearl of Zandvoort’, the 26th game of his 1935 world title match against Alekhine. 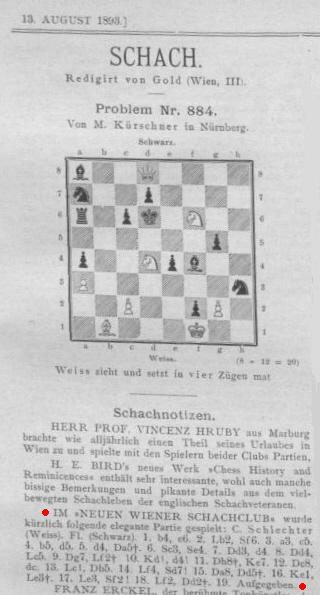 See, for instance, page 150 of Euwe’s From My Games 1920-1937 (London, 1938) and such well-known books as Wellmuth’s The Golden Treasury of Chess, Fine’s The World’s Great Chess Games and Schonberg’s Grandmasters of Chess. Various chess encyclopaedias (e.g. by Sunnucks, Golombek and Brace) have an entry for the ‘Pearl of Zandvoort’, and it is, in short, a matter on which no half-competent writer would go wrong. The Euwe win given by Schiller as the ‘Pearl of Zandvoort’ was played in Amsterdam. The most direct translation of Grünschnäbel is ‘greenhorns’ or, possibly, ‘whippersnappers’. The words ‘He is treating us like patzers’ were also quoted, by Flohr, on pages viii-ix of the English book, in a 1976 article translated from 64. A literal rendering is ‘He treats us like yellow-beaked fledglings’. The term ‘yellow-beaked’ in Russian means young and inexperienced. 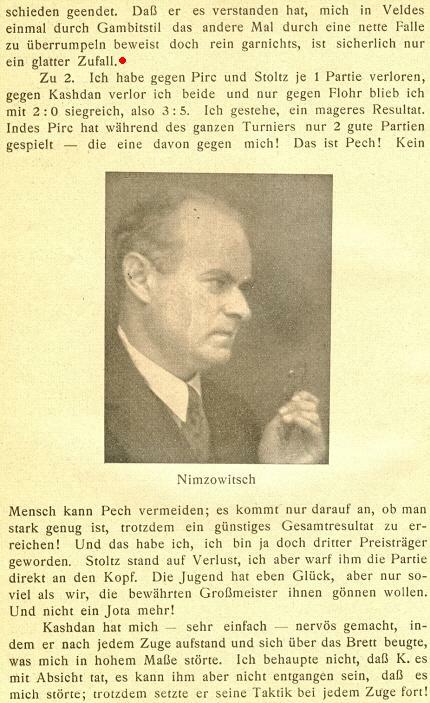 It is hoped that other sightings of the Nimzowitsch quote can be found. 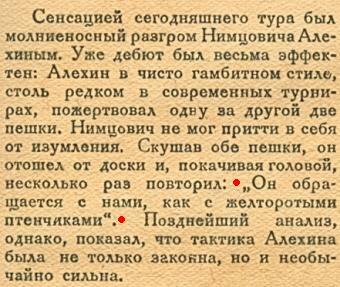 The unsatisfactory situation at present is that we have Estrin’s text in German but not the original Russian and Kmoch’s text in Russian but not the original German. 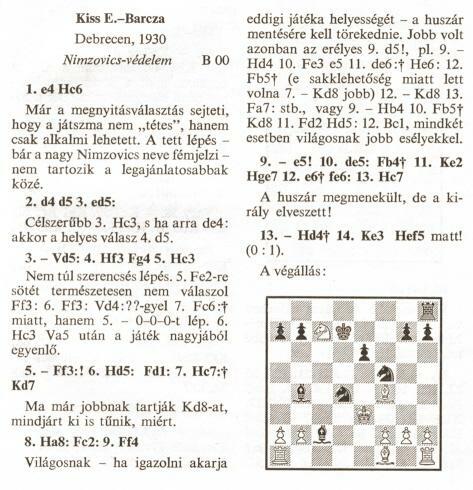 A fine article by Dirk Jan ten Geuzendam on pages 10-21 of the 5/2010 New in Chess concerns the chess library of David DeLucia. 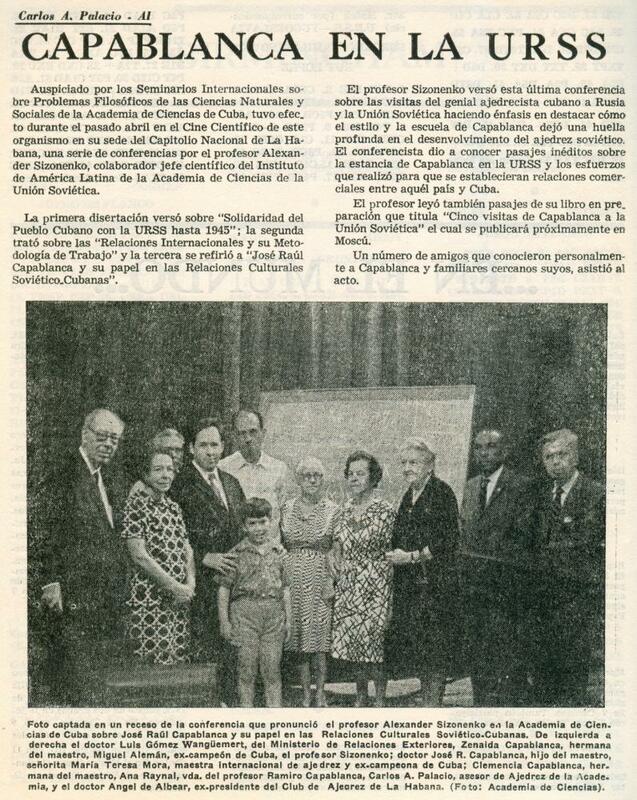 A particularly welcome piece of information is that in a planned new volume based on his collection Mr DeLucia intends to reveal the Capablanca v Tartakower game discussed by Olga Capablanca Clark in C.N. 1383 (see The Genius and the Princess). For convenience, we have brought together the various C.N. items on this topic in S. Lipschütz – Samuel, Simon or Solomon? C.N. 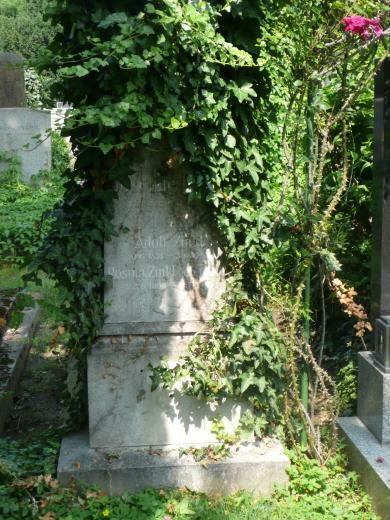 3172 noted that Lipschütz died in Hamburg, and we are still hopeful that a reader in that area will be able to check the local records for references to the master’s forename. Pierre Baudrier (Paris) draws attention to his researches into Deschapelles in the section entitled ‘Les créations du club’ at the website of the Association Gennevilloise des Echecs. 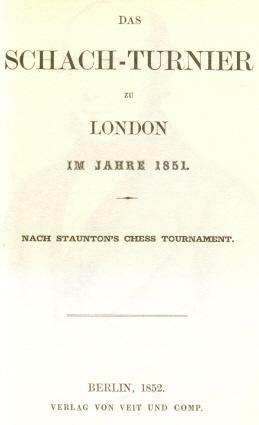 ‘Shortly after Staunton brought out his London, 1851 tournament book a German translation was published in Berlin: Das Schach-Turnier zu London im Jahre 1851 (“Nach Staunton’s Chess Tournament”). Given that the anonymous author sometimes advances a different view from Staunton’s, it would be interesting to know his identity. Extracts from the latter work, a 26-page pamphlet, were given in Attacks on Howard Staunton. Our copy has three markings. In the term ‘wilful misrepresentation’ on pages 9 and 12 the adjective has been deleted, although it remains fully legible. On page 14 the word ‘character’ has been similarly deleted, replaced by hand with ‘reputation’. The copy of the pamphlet available at Google Books has the same textual amendment, although handled in such a way that ‘character’ is no longer visible. Marc Hébert (Charny, Canada) asks for information about the famous blindfold game in which J.H. 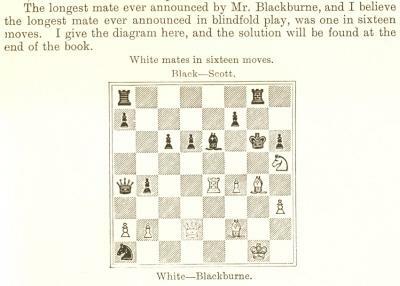 Blackburne announced mate in 16 moves. Thus the only information supplied was Black’s name: Scott. It was not stated that the game had occurred in a simultaneous display, although that assumption is commonly made. 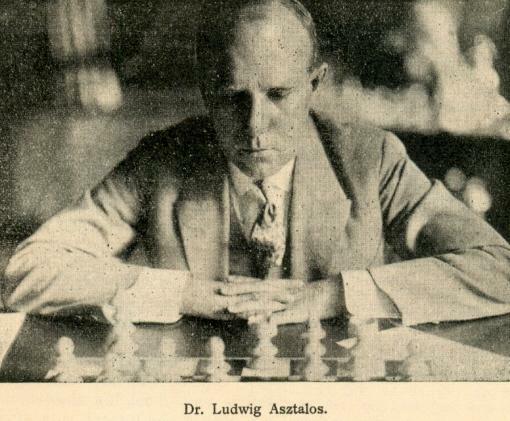 The position was given on page 41 of Blindfold Chess by E. Hearst and J. Knott (Jefferson, 2009), the co-authors stating that they had been unable to find any further particulars. Where, if anywhere, was the position published before the appearance of P. Anderson’s Graham book? We also seek bare references in nineteenth-century sources to such a game, or to an opponent of Blackburne’s named Scott. 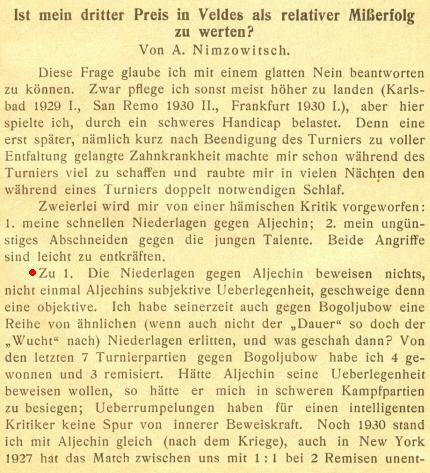 Bogoljubow’s annotations were published on pages 408-410 of the December 1929 Kagans Neueste Schachnachrichten. ‘On page 228 of Chess Results, 1747-1900 (Jefferson, 2004) Gino Di Felice gives “Laroche” a first initial “H.”, and the book lists two match results for him (against de Rivière in 1856 on page 21 and against Harrwitz in 1860 on page 31). He does not indicate a source for the initial “H.”. The question is complicated by the fact that there were two notable players named “Laroche” in France in the mid-nineteenth century. 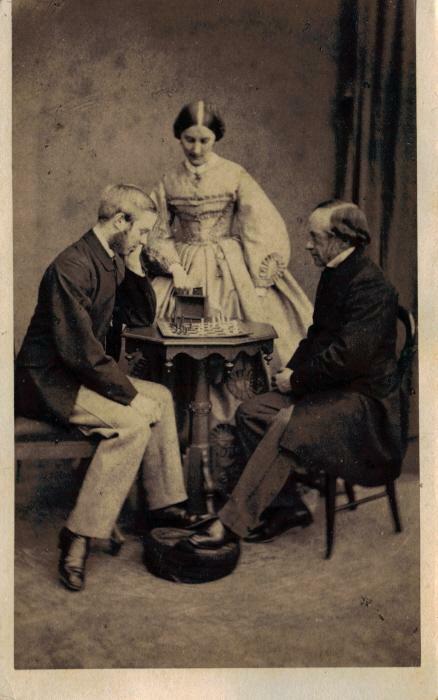 The Laroche (sometimes given as Delaroche, De La Roche or La Roche) who played de Rivière and Harrwitz, as well as Morphy (see page 177 of Edge’s book on Morphy), was born in Bayonne in the south of France (Le Palamède, 1845, page 524) but was a member of the Paris Chess Circle for many years. He was among the opponents of Labourdonnais when the latter played blindfold (Le Palamède, 1838, page 58). In 1845 he moved back to Bayonne (Le Palamède, 1845, page 524) and was subsequently often referred to as “Laroche, de Bayonne” (e.g. Le Palamède, 1846, page 474). 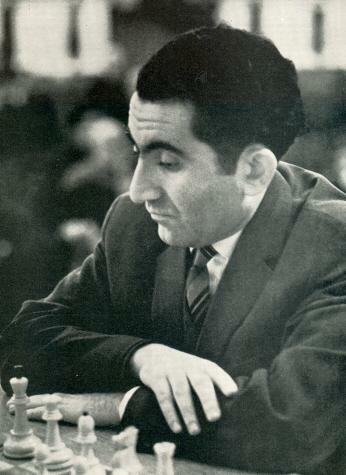 He was considered for many years one of the strongest players in France (e.g. the Chess Player’s Chronicle, 1844, page 2; La Nouvelle Régence, 1860, page 93). His death was announced in the 15 April 1866 issue of Le Sphinx (page 3). 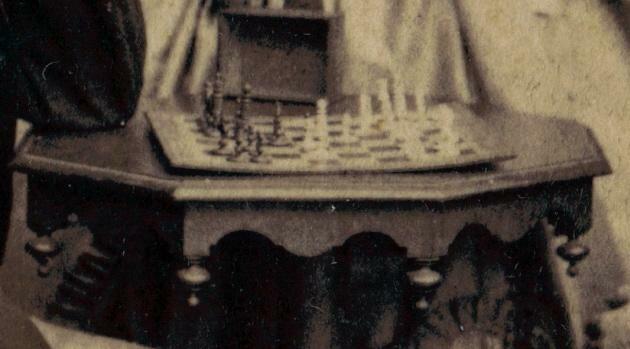 There was also a “docteur Laroche” in the Paris Chess Circle from the earlier part of the nineteenth century (Le Palamède, 1845, page 30) until his death in 1850 (La Régence, 1850, page 225). He too was described as one of the strongest Parisian players (La Régence, 1850, page 225), and it was this Laroche who played so effectively in the match between the Cercle des Echecs and the players of the Café de la Régence in 1849 (La Régence, 1849, pages 129-131; Illustrated London News, 6 June 1849, page 400; Chess Player’s Chronicle, 1849, pages 188-190). 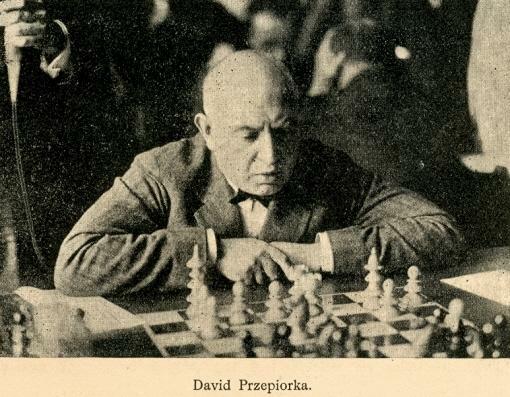 That these are distinct players is made clear by their separate appearances in lists of members (and honorary members) of the Paris Chess Circle (Le Palamède, 1845, page 135; La Régence, 1849, page 164) and in the list of subscribers to Kieseritzky’s book Cinquante Parties published in 1846 (page 49). Furthermore, in 1851 Kieseritzky bemoaned the departure of several strong players from Paris, including “Laroche”, and the death of several others, including “le docteur Laroche” (La Régence, 1851, page 134). To make matters more complex, there was at least one other player named “Laroche” in Paris about that time, though not mentioned often. A membership list of the Paris Chess Circle in 1851 mentions a “Laroche (Félix de)” as well as “Laroche, de Bayonne” (La Régence, 1851, pages 36-37), and when the latter visited London at the time of the international tournament of 1851 he was accompanied by “Laroche jeune, son frère” (La Régence, 1851, page 198). A player named “Laroche”, no doubt one of the two more famous ones, appears in the picture of the Staunton-Saint Amant match discussed in C.N. 4259, as number 26 in the index. Etienne Cornil identified him as “docteur Laroche” (on page 35 of “Le Café de la Régence” – the account referred to in C.N. 5241), while Le Palamède (1845, page 403) identified him only as “Laroche”. We note that whereas the index on page 349 of P.W. 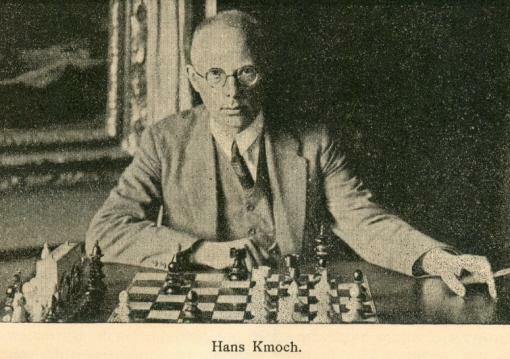 Sergeant’s book Morphy’s Games of Chess (London, 1916) had ‘La Roche’, later editions amended this to ‘La Roche, Dr H.’. 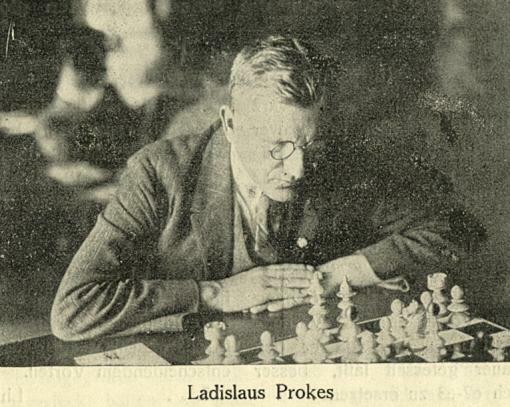 In David Lawson’s volume on Morphy the index (page 420) put ‘Laroche, M.’. It is possible, though, for misunderstandings to arise with the initials M. and H. as a result of their use as abbreviations for Monsieur and Herr. For an example concerning Monsieur, see The Fox Enigma. 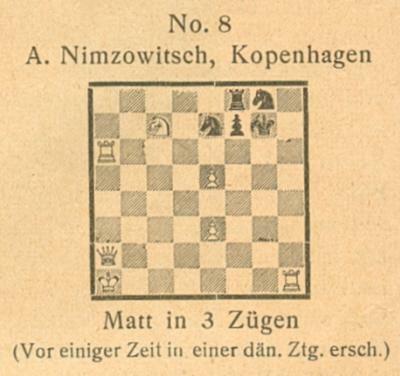 In the passage marked with red Nimzowitsch states that his two defeats against Alekhine prove nothing. He mentions that although at one time he suffered a series of defeats against Bogoljubow, his latest score against him in tournament games is four wins, three draws and no losses. 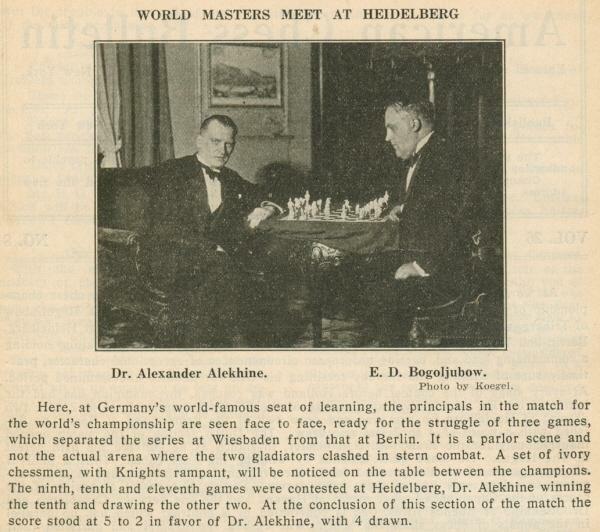 Nimzowitsch adds that as recently as 1930 (presumably 1920, since he also writes ‘after the War’) he stood equal with Alekhine; moreover, he had a tied result in his games with him at New York, 1927. 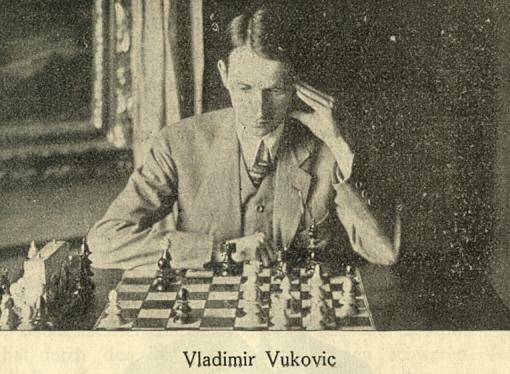 Nimzowitsch’s conclusion is that Alekhine, to demonstrate his superiority, would have to defeat him in hard battles, whereas his two victories over him in the Bled tournament, one in gambit style and the other by catching him out with a pretty trap, proved absolutely nothing and were certainly pure chance. Wanted: details about the composition’s prior appearance in a Danish publication, as mentioned in the caption. 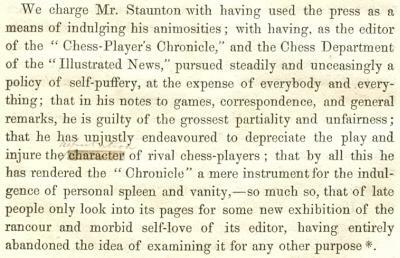 We note that the same remark appeared on page 162 of the Chess Monthly, February 1889. Which games published before 1887 could Hoffer have had in mind? Taylor Kingston (Shelburne, VT, USA) comments regarding the position in C.N. 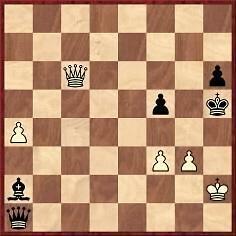 6691, where Blackburne is said to have announced mate in 16 moves, that White can give mate in eight. After 1 Rxe6+ Kh7 2 Qd3+ Rg6 the announced mate was 3 Qxg6+ fxg6 4 Re7+ Kg8 5 Be6+ Kf8 6 Rf7+ Ke8 7 Nf6+ Kd8 8 Rd7+ Kc8 9 Rxa7+ Kb8 10 Nd7+ Kc8 11 Nc5+ Kd8 12 Rd7+ Kc8 13 Rf7+ Kd8 14 Nb7+ Ke8 15 Nxd6+ Kd8 16 Rd7. The analysis engine Rybka agrees that this is the best play for both sides if White chooses 3 Qxg6+, but it gives the line 3 Rxg6 fxg6 4 Qxd6 Qd1+ 5 Bxd1 gxh5 6 Qe7+ Kh8 7 Bd4+ Kg8 8 Qg7 mate. Michael McDowell (Westcliff-on-sea, England) notes that Nimzowitsch’s composition was included on page 83 of Godehard Murkisch’s book Rätselvolle Schachaufgaben (Munich, 1985), the source being stated as the Baltische Zeitung, 1919. 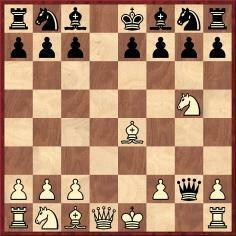 White’s king was on c1, and not a1. 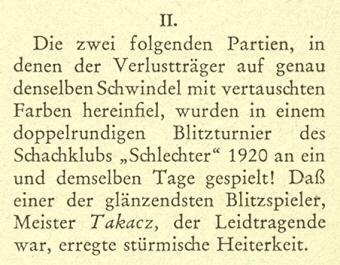 Nikolai Brunni (Honolulu, HI, USA) mentions that that same position is given on-line at a Nimzowitsch page (‘Baltische Zeitung, 1918’).